The poor and the middle class work for money, the rich have money work for them. It is fear that keeps most people working at a job. Most people become a slave to money. Learn to have money work for you. Too many people are focused too much on money and not their greatest wealth, which is their education. So many people say, “Oh, I’m not interested in money.” Yet they’ll work at a job for eight hours a day. Taxes, you’re taxed when you earn, you’re taxed when spend, you’re taxed when you save and you’re taxed when you die. Chapter Two – LESSON 2: Why Teach Financial Literacy? You must know the difference between an asset and a liability, and buy assets. Rich people acquire assets. The poor and middle class acquire liabilities, but they think they are assets. The rich acquire assets and the poor and the middle class acquire liabilities. An asset is something that puts money in my pocket. A liability is something that takes money out of my pocket. It is the cash flow that tells the story. It is the story of how a person handles their money, what they do after they get the money in their hand. Their spending habits have caused them to seek more income. If you find you have dug yourself into a hole…stop digging. Remember the golden rule. He who has the gold makes the rules. According to psychiatrists, the fear of public speaking is caused by the fear of ostracism, the fear of standing out, the fear of criticism, the fear of being an outcast. The fear of being different prevents most people from seeking new ways to solve their problems. It is only when we as humans look into the mirror do we find truth. The fear of ostracism that causes people to conform and not question commonly accepted opinions or popular trends. An intelligent person hires people who are more intelligent than they are. Schooling process actually discourages creativity. When it comes to money, high emotions tend to lower financial intelligence. Money has a way of making every decision emotional. Because they have no money to invest, they simply do not invest. 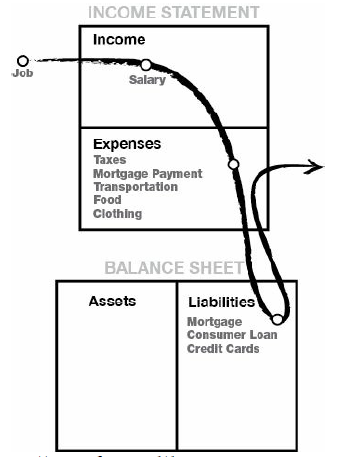 The rich buy assets, the poor only have expenses, the middle class buys liabilities they think are assets. Financial struggle is often directly the result of people working all their life for someone else. The mistake is becoming what you study is that too many people forget to mind their own business. 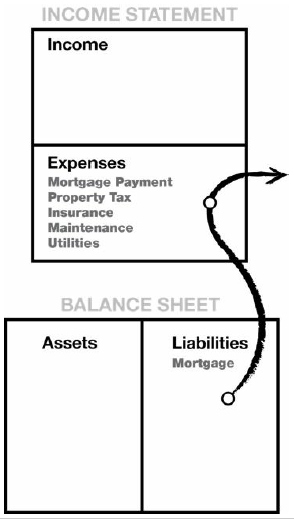 Your business revolves around your asset column, as opposed to your income column. Life is sometimes tough when you do not fit the standard profile. Keep your expenses low, reduce your liabilities and diligently build a base of solid assets. Royalties from intellectual property such as music, scripts, patents and anything else that has value, produces income or appreciates and has a ready market. The first lesson of having money work for me, as opposed to working for money, is really all about power, If you work for money, you give the power up to your employer. If your money works for you, you keep and control the power. Start minding your own business. Keep your daytime job, but start buying real assets, not liabilities. You need to know the law and how the system works. 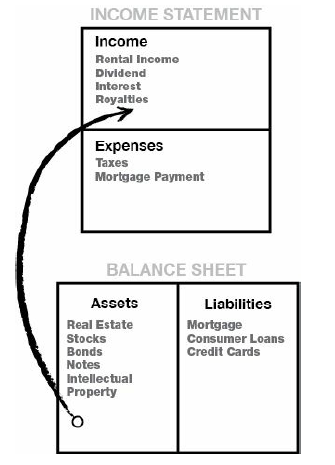 The diagram shows how the corporate structure sits outside your personal income statement and balance sheet. Each dollar in my asset column was a great employee, working hard to make more employees and buy the boss a new Porsche. Be smart and you won’t be pushed around as much. If you know you’re right, you’re not afraid of fighting back. By relying solely on a paycheck from a corporate employer, I would be a docile cow ready for milking. Why not own the ladder. Idea of owning my own corporation. Financial IQ is made up of knowledge from four broad areas of expertise. No. 1 is accounting. No. 2 is investing. No. 3 is understanding markets. No. 4 is the law. The one thing that holds all of us back is some degree of self-doubt. It is not so much the lack of technical information that holds us back, but more the lack of self-confidence. In the real world outside of academics, something more than just grades is required, I have heard it called guts, balls, audacity, bravado, cunning, daring, tenacity and brilliance. This factor, whatever it is labeled, ultimately decides one’s future much more than school grades. I recognized that it was excessive fear and self-doubt that were the greatest detractors of personal genius. It’s not the smart that get ahead but the bold. Take risks, to be bold, to let their genius convert that fear into power and brilliance. Most people only know one solution: work hard, save and borrow. The more real you think money is, the harder you will work for it. If you can grasp the idea that money is not real, you will grow rich faster. An untrained mind can also create extreme poverty that lasts lifetimes by teaching it to their families. Money did not change hands. Agreements did. Financial intelligence is made up of these four main technical skills. The law. The awareness of accounting, corporate, state and national rules and regulations. I recommend playing within the rules. The more I learn – and there is a lot to learn – the more money I make simply because I gain experience and wisdom as the years go on. My overall philosophy is to plant seeds inside my asset column. Invest more in their financial education than in the stock, real estate or other markets. The smarter you are, the better chance you have of beating the odds. We learn by making mistakes. We learn to walk by falling down. If we never fell down, we would never walk. Unfortunately the main reason most people are not rich is because they are terrified of losing. It’s what you know more than what you buy. Investing is not buying. It’s more a case of knowing. They are one skill away from great wealth. Most people need only to learn and master one more skill and their income would jump exponentially. Job security meant everything to my educated dad. Learning meant everything to my rich dad. You want to know a little about a lot. The hardest part of running a company is managing people. The most important specialized skills are sales and understanding marketing. It is communication skills such as writing, speaking and negotiating that are crucial to a life of success. In addition to being good learners, sellers and marketers, we need to be good teachers as well as good students. To be truly rich, we need to be able to give as well as to receive. The more they gave, the more they received. The primary difference between a rich person and a poor person is how they manage fear. Five main reasons why financially literate people may still not develop abundant asset columns: fear, cynicism, laziness, bad habits, arrogance. The greatest reason for lack of financial success was because most people played it too safe. For most people, the reason they don’t win financially is because the pain of losing money is far greater than the joy of being rich. If you have any desire of being rich, you must focus. Put a lot of your eggs in a few baskets. Do not do what poor and middle class people do: put their eggs in many baskets. Cynics criticize, and winners analyze. They don’t make money because they chose to not lose money. Our world progresses because we all desire a better life. Eleanor Roosevelt said it best: “Do what you feel in your heart to be right – for you’ll be criticized anyway. You’ll be damned if you do, and damned if you don’t. 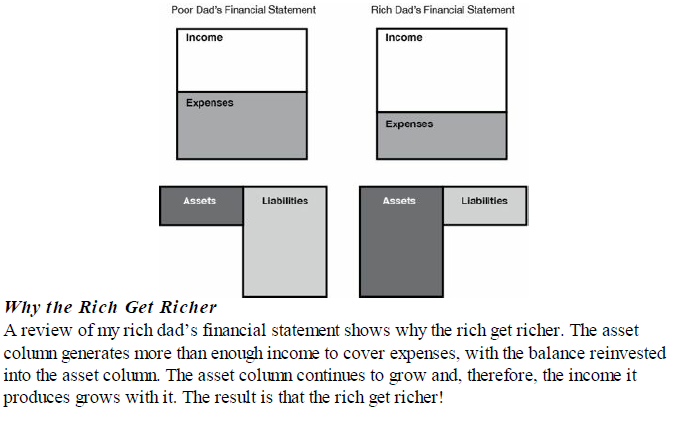 Rich dad believed that the words “I can’t afford it” shut down your brain. “How can I afford it?” opens up possibilities, excitement, and dreams. If I pay myself first, I get financially stronger, mentally and fiscally. There is gold everywhere. Most people are not trained to see it. Most people choose not to be rich. Our spending habits reflect who we are. Poor people simply have poor spending habits. Arrogance is ego plus ignorance. Just because you have no money, it should not be an excuse to not learn. Invest first in education. In reality, the only real asset you have is your mind. Arrogant people rarely read or buy tapes. Why should they? They are the center of the universe. Chickens of a feather agree together. A truly intelligent person accumulated ideas. Listening is more important than talking. If that was not true, god would not have given us two ears and only one mouth. One of the hardest things about wealth building is to be true to yourself and be willing to not go along with the crowd. Master a formula and then learn a new one. Pay yourself first: the power of self-discipline. If you cannot get control of yourself, do not try to get rich. The lack of personal self-discipline that is no.1 delineating factor between the rich, the poor and the middle class. The world will push you around. The world pushes people around not because other people are bullies, but because the individual lacks internal control and discipline. People who lack internal fortitude often become victims of those who have self-discipline. Having the guts to go against the tide and get rich. Don’t get into large debt positions that you have to pay for. Keep your expenses low. Build up assets first. Poor people have poor habits. A common bad habit is innocently called “Dipping into savings”. The rich know that saving are only used to create more money, not to pay bills. If you’re not tough inside, the world will always push you around anyway. Limit my losses to only the money I have in at that time. Learn how to have money work for you. Too often today, we focus on borrowing money to get the things we want instead of focusing on creating money. Remember, the easy road often becomes hard, and the hard road often become easy. To be the master of money, you need to be smarter than it. Stop doing what is not working and look for something new to do. Find someone who has done what you want to do. Make lots of offers. When I want a piece of real estate, I look at many properties and generally write an offer. If you don’t know what the “right offer” is, neither do I. That is the job of the real estate agent. They make the offers. I do as little work as possible. Most sellers ask too much. It is rare that a seller will actually ask a price that is less than something is worth. Make offers. People who are not investors have no idea what it feels like to be trying to sell something. Search, offer, reject, negotiate and accept are all parts of the process of almost everything in life. You need to know what you’re looking for and then go look for it. Profit is made when you buy, not when you sell. I shopped at the foreclosure department of a bank. I paid $500 for a class on how to do this. Buy the pie and cut it in pieces. Small people remain small because they think small; act alone, or don’t at act all. Learn from history. All the big companies on the stock exchange started out as small companies. The important words being “done” and “do”. You must take action before you can receive the financial rewards. Act now. Without financial training, we all too often use the standard formulas to get through life, such as to work hard, save, borrow and pay excessive taxes. Today we need better information. Money is only as idea. If you want more money simply change your thinking. Every self-made person started small with an idea, then turned it into something big. The same applies with investing. It takes only a few dollars to start and grow it into something big. It’s what is in your head that determines what is in your hands. The three incomes: earned income, passive income, portfolio income. The key to becoming wealthy is the ability to convert earned income into passive income and/or portfolio income as quickly as possible. The taxes are higher on earned income. The least taxed income is passive income. All a real investor does is convert earned income into passive and portfolio income. You could never learn to ride a bicycle by only reading a book. If you do not know those differences in the three incomes and do not learn the skills on how to acquire and protect those incomes, you will probably spend your life earning less than you could and working harder than you should. Earned income is money you work for and passive and portfolio income is money working for you. The main reason people struggle financially is because they spent years in school but learned nothing about money. The result is, people learn to work for money…but never learn to have money work for them. Take responsibility for your finances or take orders all your life. You’re either a master of money or a slave to it. Love the work you are doing ! Are able to summarize ‘Guide to investing in Gold and Silver’ by Mike Maloney?